Home READ BLOG! 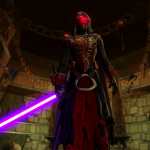 SWTOR Shadow of Revan Expansion and 12x XP! Coming on the heels of AIE:SWTOR launching our Guild Flagships, Strongholds and engaging in some epic guild versus guild Conquest, BioWare has introduced the next game-changerTM and announced the Shadow of Revan Digital Expansion. Shadow of Revan will launch the first week in December. In order to prepare players for the new content and a level cap increase from 55 to 60, BioWare has enabled special perks for subscribers who have pre-ordered the $19.99 expansion. In addition to early access at launch, an experience bonus of 12x has been enabled for all class story missions. This has been heartily embraced by our guild and an altapalooza is in progress with new 55s popping up on a constant basis. If you have any old alts you’ve been itching to get to 55 now is a great time to jump in and enjoy the story. If you need a guild invite, drop in on the Jedi Covenant server and “/cjoin aielfo” on either the Republic or Imperial sides and we’ll get you set up. As always, check the forums for more information and check out things like our open Operations on Tuesday’s Mandatory Fun Night (attendance is optional but the fun is mandatory), Friday Flashpoints and Galactic Starfighter fights, our own SWTOR Escape Podcast, and a few Operations teams always keeping an eye out for subs and new members!